There’s a new Kettle Corn stand at Findlay Market. 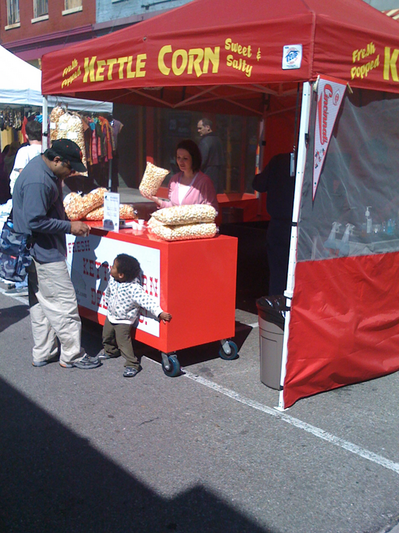 Fresh popped Kettle Corn with samples for you to try. Regular is good, but the caramel is where it’s at. Not too sweet with a hint of saltiness. I highly recommend it. Just noticed the kid in the picture- not sure what he’s doing. Well, when I talked to them, they said that they were new and that starting in May that they’d be moving to the south side of Findlay Market. Also, while I was there, a Findlay Market person was explaining to them where to sign out when they leave.